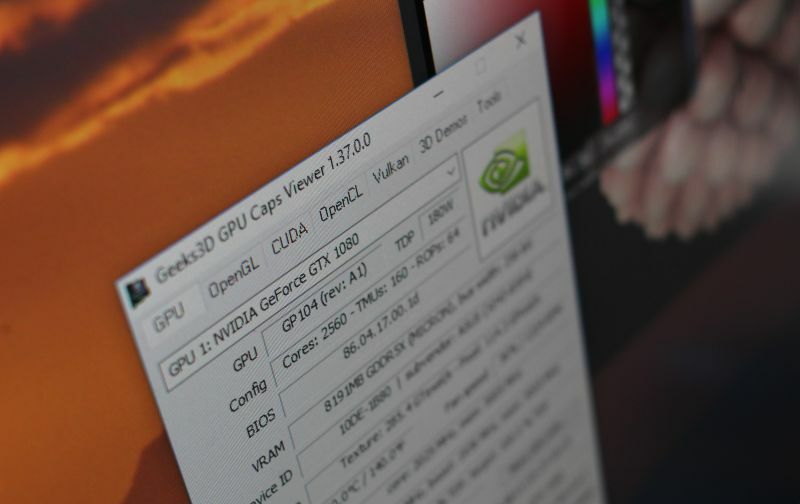 GPU Caps Viewer 1.37.0 comes with the support of latest GeForce GTX 1070 Ti. The support of Windows XP is back (WinXp covers around 5% of the desktop OS market). 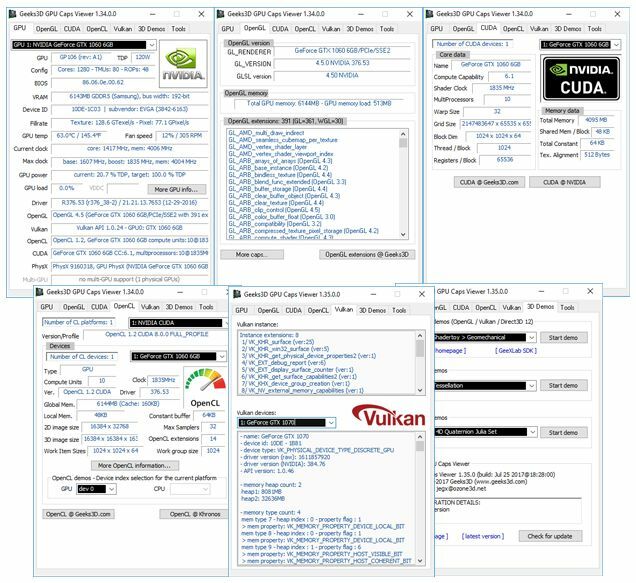 The GeeXLab SDK has been updated to the latest version and fixes some bugs in the Vulkan renderer. New demos (tessellation demo in Vulkan and OpenGL) have been added to the GeeXLab demos list. + added support of the GeForce GeForce GTX 1070 Ti.
! compiled with WinXP support (broken in prev versions). 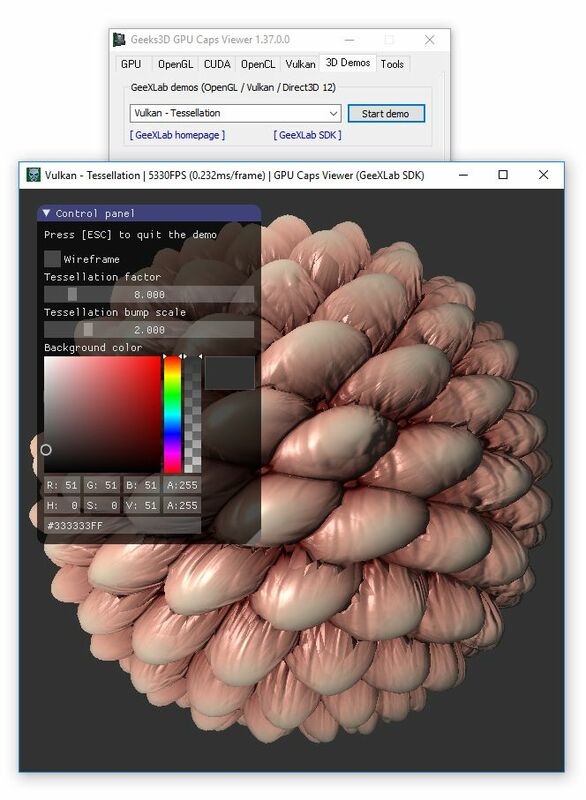 fixed in the swapchain management in the Vulkan plugin).
! recompiled with latest Vulkan API headers (v1.0.65).
! 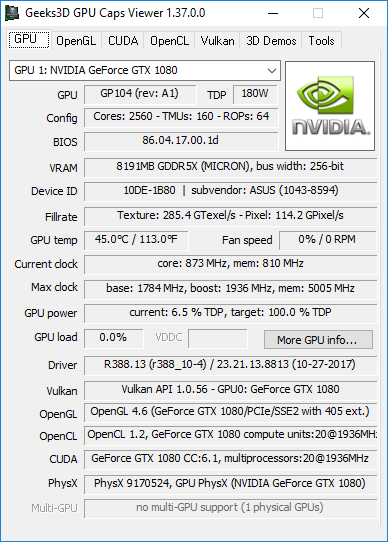 updated: ZoomGPU 1.21.2 (GPU monitoring library). As I know from a previous version (only a few months before) some of the demos/tools (which are mostly ancient and obsolete) are broken and cause serious instability (exclusive, on a GTX 1070 on Windows 7). Furmark runs stable and like a charm in comparison. Avira complains on gxc_x32.dll and move to quarantine. It’s a false positive from Avira. The 64-bit version (gxc_x64.dll used in GeeXLab for example) is clean for Avira. It’s not the first time I have false positive on 32-bit code. I submitted gxc_x32.dll to Avira. Wait and see. Maybe it’s time for me to stop 32-bit platforms and release only for 64-bit. Thx for explanation. Its just a bit irritating from avira side. 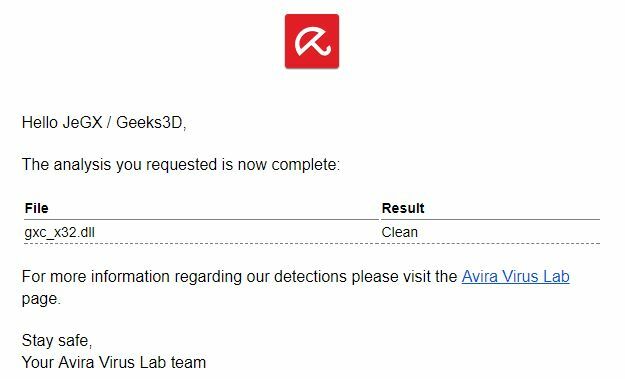 Avira virus definition should be updated very shortly. Would the source code be available by any chance? In demo “OpenGl 3.2 – Geometry Instancing” I don’t see these 5000 boxes, only dark grey background.